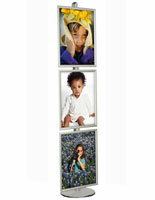 Snap Frames : This poster frame stand features 3 display frames for showcase eye-catching graphics! This 8ft sign frame stand is a great way to put your large posters and advertisements on display! Constructed of an 8ft aluminum pole, heavy base and three 22" x 28" poster holders, this sign frame stand is a display system that will not be missed. 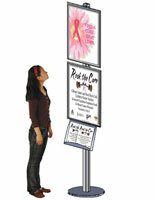 Use your sign frame stand in busy stores, popular venues and high traffic areas to reach many people at once. 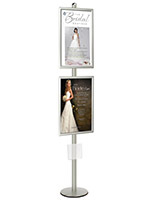 Each poster holder on the sign frame stand has an easy to use, snap-open design that makes poster changes a breeze. Unlike sign frames that load from the back, the poster holder does not have to be removed to switch your image. Just lift open the sides of the frame, insert your poster or sign, and snap the sides down again. This sign frame stand comes with lexan overlays to reduce glare and keep your advertising images protected and preserved. As such a flexible and hassle-free display system, this sign frame stand is perfect as a retail display or lobby fixture. This sign frame stand is a durable, yet elegant display system that will stay looking new through future events. With the base weighing over 20lbs, you can be sure that your sign frame stand will remain steadfast even in crowded areas. 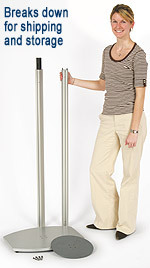 Even standing 8ft tall, you won't have to worry about your retail display wobbling or falling over. We also sell this sign frame stand with black plastic "feet" on the base, to prevent your floors from being scratched. Use a sign frame stand in your store, mall, convention hall or other busy area to advertise your company, product, service or special promotion. Despite its large size, this sign frame stand is a relatively easy product to put together with two people. Grooves along the main pole allow you to adjust the included snap frames to any appropriate height. To attach them, just loosely screw the connectors to the sides of each poster holder and slide the screw and connectors along the grooves. After you adjust your frames to whatever height you desire, tighten the screws and insert your images. Although we sell this sign frame stand with three poster holders, you can also purchase more accessories to change around the look of your display system. We have different sized poster frames, banner holders, literature pockets and headers! 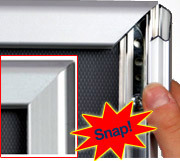 The frame stands come with wall screws to give you the option of using the frame as a wall display. These screws are not necessary for assembling your frame stand otherwise.